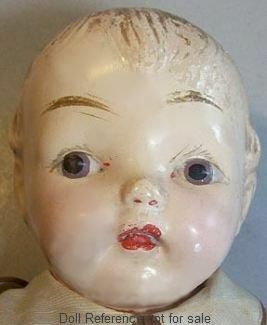 1920s Royal, all composition doll, 21" tall, molded painted hair, painted eyes, closed mouth, doll marked Royal Doll. The Royal Toy Manufacturing Company was established by Morris Bonet in 1914, the company was then bought by Henry and Rose Frankel, Rose did the designing. Royal dolls in this era are usually marked on the dolls head: Royal Toy or Royal Doll. In 1973 the company merged with the Jolly Toy Company, so some dolls from this era may have the Jolly Toy mark as well Royal. In 1977 Miss Elsa Raiji bought the company, she was a designer at the company since 1951, excellent doll costumes are a hallmark of her talents. Other Royal named dolls not shown are; Annabelle, Prize Winner Baby, Royal Baby Bunting, Royal doll Line, Spirit of America. See below for more Royal identified dolls. Note: The 14R doll marking can also be found on Belle Doll & Toy Corp, Deluxe Reading, Eegee, Natural, Rite Lee and Sayco dolls. So unless the doll has a clothing tag or is in it's original box, there may be no way to tell which doll company originally made the particular doll. 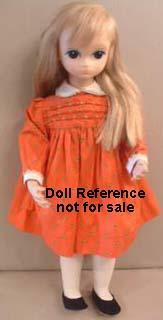 1964 Royal Lonesome Lisa doll or Lonely Lisa doll, 16 & 20" tall, long rooted hair, big brown painted eyes, wired cloth body that poses, wears a red printed dress with white cuffs on sleeves white collar, also had a white half apron that tied at the waist and black slip on shoes. 1964 Lonesome Lisa doll, 20"
1965 Royal Robin doll, 20" tall, (Lonely Lisa's friend), cloth stuffed body, vinyl head & arms, painted side glancing eyes, dressed in a yellow polka dot dress and black shoes, unsure how she is marked. Thank you Le for sharing!! 1965 Royal Joy doll, 11" tall, vinyl head, hard plastic jointed body, big painted eyes, closed mouth, rooted hair, doll marked: A Royal Doll 1965. 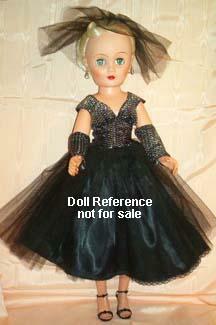 Both Uneeda, Tiny Treasures dolls and Regal Toy Co. Canada, Judy dolls, are clone Joy doll look a likes. 1972 Royal Baby Joy doll, 5 3/4-6" tall, one piece seated baby doll, all rubber squeak toy, with molded hair, painted side glancing eyes, open mouth, molded painted socks and shoes. 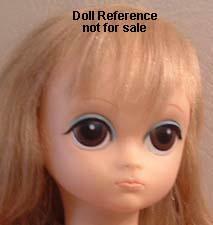 Doll marked on back Baby Joy © 1972. 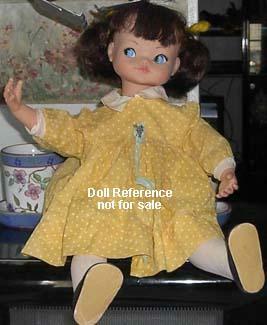 1972 Baby Joy doll, 6"
ca. 1920s Royal Baby Joy doll, 18" tall, composition head, tin sleep eyes, open smiling mouth, painted molded hair, cloth body, doll marked on back shoulder plate: Baby Joy Royal.